Minneapolis, MN (February 15, 2018): Central Living by David Weekley Homes, the high-density division of David Weekley Homes offering luxury living in prime locations, is now selling award-winning homes to the northwest Minneapolis community of Donegal South. Priced from the low $300s, sales are underway with two model homes, The Commondale and The Highgate, now open. The community will include 133 detached two- and three-story homes featuring David Weekley’s signature open-concept floor plans and modern, gourmet kitchens with large islands. Some homes will offer an elevator option. Donegal South offers nearly one acre of open common space with a fire pit and walking trails, and is within walking distance to downtown Maple Grove, which offers shopping and dining at Arbor Lakes and Main Street. In addition, there are many family activities at Town Green in Central Park and access to 36 miles of parks and trails. Students attend ISD 2709 – Osseo Area Schools and the community provides easy access to Interstates 694, 494 and 169 and major employers in the area, including Boston Scientific, Medtronic, Cargill, and Target. The model home will be part of the Parade of Homes, presented by the Builder’s Association of Twin Cities, between February 24-March 25. The model home is located at 8144 Central Park Way in Maple Grove. For more information about Donegal South, call 763-251-0339 or visit DavidWeekleyHomes.com. 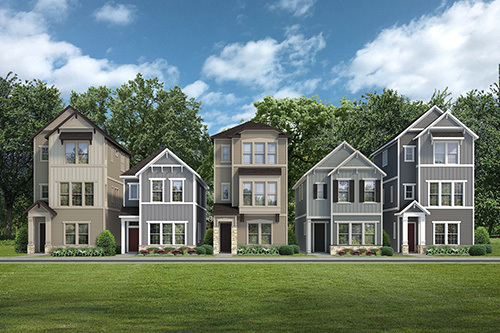 Artistic rendering of the two- and three-story townhomes in Donegal South.